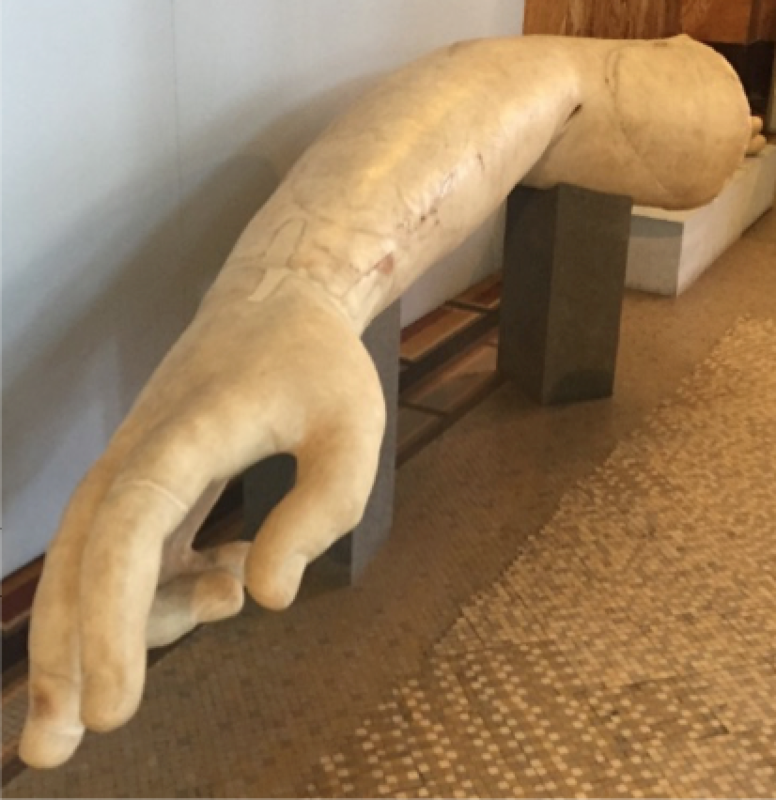 This month’s blog is by Josh Littell, who studied at Kent’s Rome Centre during his MA in Ancient History (2016-17), whilst in Rome, fragments of a colossal statue in the Museum Centrale Montemartini caught his eye and he developed this blog to decipher the context of its discovery and a better understanding of some temples in Rome that are often only glanced at. 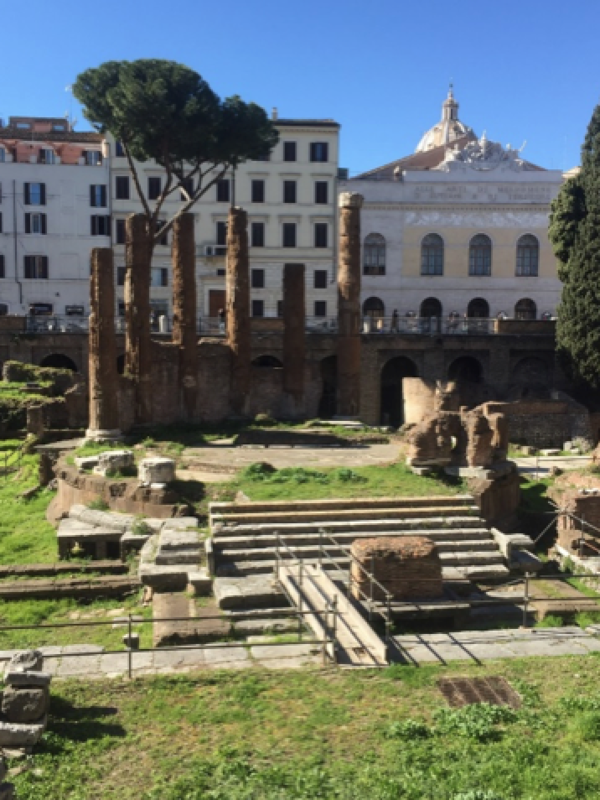 The Republican temples of the Largo Argentina are of little interest to most tourists visiting Rome, often an excursion is made to see the semi-feral cats that live amongst the ruins. However, the Sacra Area di Largo Argentina continues to be of interest to academics as the identity of some of the temples, labelled A to D from north to south, remain contested. Temple B. The Aedes Fortunae Huiusce Diei. Photograph: Josh Littell. During the excavation, which commenced in summer 1926, and the site’s inauguration, in spring 1929, two further temples were discovered, C and D, beside the previously exposed temples A and B. When these temples were discovered, fragments of a colossal female statue buried between temples B and C were also unearthed; these fragments now reside in the Centrale Montemartini museum. From the colossal statue, thought to be the cult icon of Temple B’s deity, the identity of the Temple, as the Aedes Fortunae Huiusce Diei (Temple of Fortune on This Day), became generally accepted. The discovery of the acrolith remnants 1928. Photograph: Wikicommons. 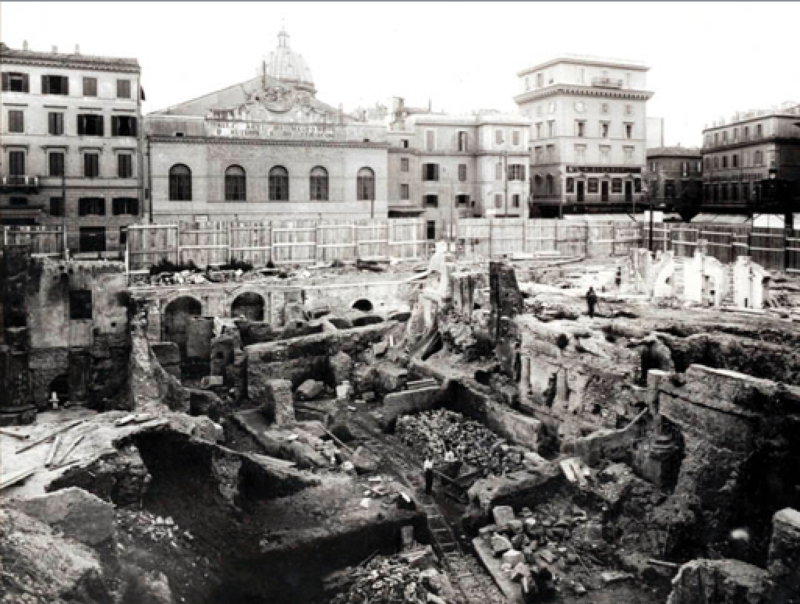 The Largo Argentina during early stages of the excavation. Photograph: Wikicommons. Although other temples to Fortuna exist in Rome, such as the temple in the Area Sacra di Sant’Omobono, there is no archaeological evidence of any other public shrines or temples to this specific aspect of the goddess in existence. While another shrine, located on the Palatine Hill, is mentioned in passing by Pliny (Natural History, 34.54), it cannot be verified. The inability to compare this aedes to any other example dedicated to Fortuna Huiusce Diei, anywhere in the Roman world, heavily restricts any detailed analysis of the deity and renders her somewhat of a mystery. With such a paucity of information, what do we know about this iteration of Fortuna? The examination of the Fortuna Huiusce Diei and the aedes in which it was dedicated will be the subject of this blog. While there is little information regarding Fortuna Huiusce Diei within archaeological record and even less within literature, the reason for which the temple at Largo Argentina was dedicated is evident in the written record. During the final battle between the Cimbri and the Roman Republic known as the Battle of Vercellae (101 BC), the Roman general, Quintus Lutatius Catulus, vowed to devote a temple to Fortuna Huiusce Diei if he was victorious; he subsequently dedicated the aedes on the 30th July 101 BC. This event is documented by Plutarch in the Life of Marius (26.2), as Marius also held imperium as consul in this battle. The temple that Catulus had erected was a tholus, placed upon the Sacra Area. The placement of the aedes and literary mention adds further creditability to the theory that Temple B is Catulus’ aedes. Varro remarks that Catulus’ aedes was a tholus (De Re Rustica, 3.5.12) and Temple A, constructed early in the mid-3rd Century BC, was also built by another member of the gens Lutatia. From examination of the extant portions of the structure, it is known that the aedes Catuli was constructed using 11 metre travertine columns, eighteen in number, with Anio tufa Corinthian capitals, all of which sat atop a 2.5 metre podium. This impressive shrine is mentioned by Cicero as a splendid monument that one visits to refine and enrich the beholder (In Verrem, 2.4.126). Although Cicero does not mention the colossal statue directly, his wording, ‘eat … ad monumentum Catuli’, may incorporate both the building and the statue. Unfortunately, no direct mention or description of the colossal sculpture survived within ancient text, making study specifically of the sculpture wholly reliant upon archaeological methods and scholarly interpretation. 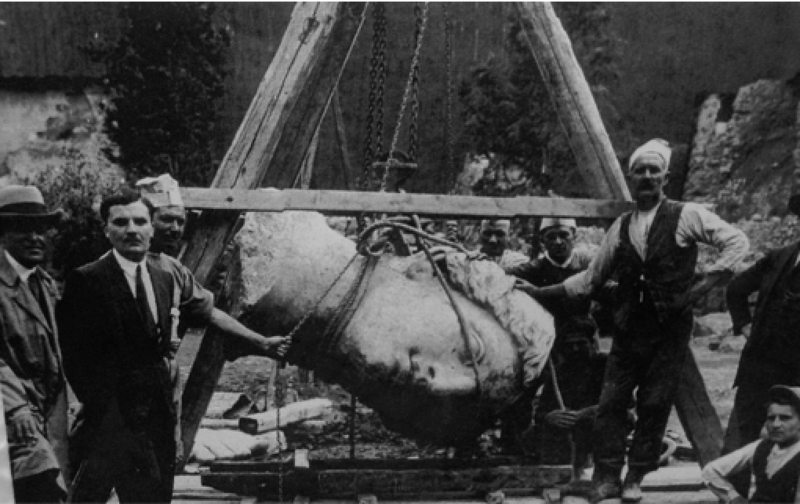 Our records of the colossal statue begin with its discovery. 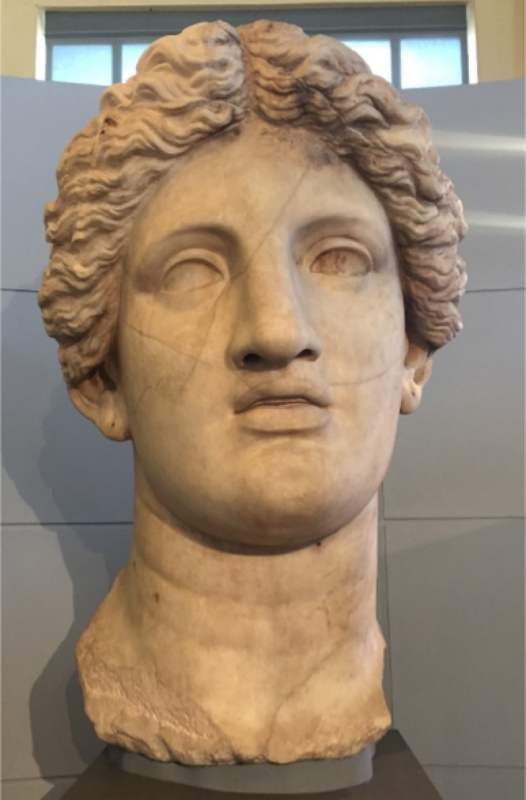 The identity of the sculpture was at first difficult to interpret due to the sculptor’s depiction of Fortuna’s face with noticeably masculine features, including a prominent jawline and also a large nose and ears. The head of the acrolith. Photograph: Josh Littell. The right arm and the sandaled feet of the acrolith. Photograph: Josh Littell. The discovery was first interpreted by Marchetti Longhi and believed to depict Apollo. However, due to the context of the find, next to what was later perceived to be Catulus’ tholus, and the androgynous appearance of the sculpture, which has its ears pierced and a female hairstyle, its identity has been determined to be Fortuna. The sculptor, who is often argued as being a Greek artist settled in Rome named Skopas Minor, most likely had the sculpture prefabricated for dedication without a specific deity, or even gender, in mind, working alterations in to suit the commission later. The colossal sculpture created by Skopas was originally an acrolith, composed of what is most likely Parian marble and a no longer remaining bronze robed body and cloak. 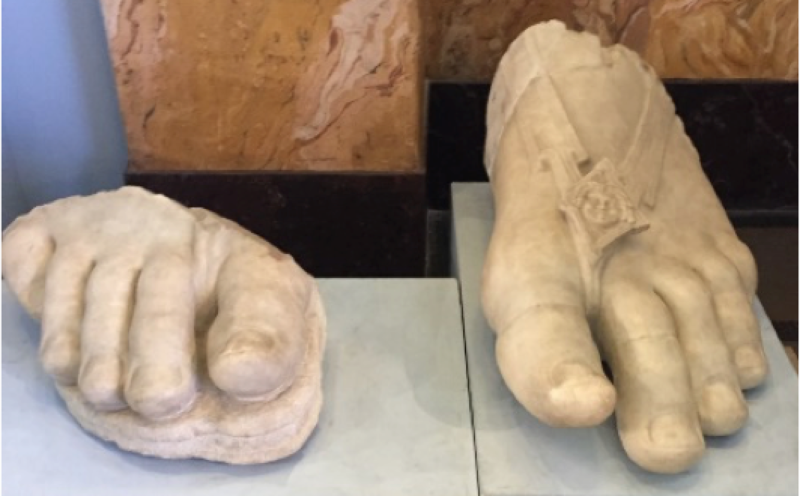 The existing marble pieces comprise of the head and neck, the right arm and the sandaled feet. The head and neck alone measure 1.46 metres from top to bottom. From the size of the head and neck, as well as the aforementioned size of the tholus, the sculpture is often hypothesised to have been around 8 metres tall, placed in the temple’s centre and generally believed to have been in a standing position when complete. Although it cannot be proved, scholars, such as Eleanor Leach, have argued that the statue would have held the cornucopia and been adorned with a diadem, a common feature of cult deity statues. The colossal sculpture and aedes were most likely left in a state of dilapidation after the 4th Century as Paganism began to decline due to Roman Christianisation. After this period, the acrolith’s bronze body would undoubtedly have been melted down for financial gain, following the cult’s loss of relevance. While we have scarce contextual information on the colossal statue or the aedes dedicated by Catulus, limiting our understanding mainly to the material and physical aspects of the temple and its statue, the nature and the importance of these two artefacts is clear. The colossal statue and the aedes, as a monument, are the only strong extant evidence we have of the worship of the Fortuna Huiusce Diei in both Rome and the Roman Empire. Although we are aware of Fortuna Huiusce Diei’s existence, many details of her worship and significance to Roman life remain a mystery. Unless future archaeological finds reveal more detailed information pertaining to Fortuna Huiusce Diei, the specifics of this aspect of the goddess and her cult will continue to remain unknown and debated. Aicher, P.J. (2013). Rome Alive: A Source Guide to the Ancient City, Vol. 1. Mundelein, Illinois: Bolchazy-Carducci Publishers, Inc.
Bertoletti, M.; Cima, M.; Talamo, E. (1997). Centrale Montemartini Musei Capitolini. Milan: Electa. Cicero. In Verrem. Transl. Yonge, C.D. (1903). London: George Bell and Sons. Claridge, A. (2010). Rome: An Oxford Archaeological Guide. Oxford: Oxford University Press. Clark, A.J. (2007). Divine Qualities: Cult and Communities in Republican Rome. Oxford: Oxford University Press. Coarelli, F. (2007). Rome and Environs: An Archaeological Guide. Transl. Clauss, J.J. and Harmon, D.P. London: University of California Press. Leach, E.W. (2010). ‘Fortune’s Extremities: Q. Lutatius Catulus and Largo Argentina Temple B: A Roman Consul and His Monument’, Memoirs of the American Academy in Rome, Vol. 55. pp. 111-134. Pliny the Elder. The Natural History. Transl. Bostock, J.; Riley, H.T. (1855). London: Taylor and Francis Group. Plutarch. Plutarch’s Lives. Transl. Perrin, B. (1920). London: William Heinemann Ltd.
Pollitt, J.J. (1978). ‘The Impact of Greek Art on Rome’, Transactions of the American Philological Association, Vol. 108. pp. 155-174. Richardson, L. Jr. (1992). A New Topographical Dictionary of Ancient Rome. Baltimore: John Hopkins University Press. Rüpke, J. (2012). Religion in Republican Rome: Rationalization and Ritual Change. Philadelphia: University of Philadelphia Press. Thorton, T.C.G. (1986). ‘The Destruction of Idols: Sinful or Meritorious?’ The Journal of Theological Studies, Vol. 37, No. 1. pp. 121-129. Varro. De Re Rustica. Transl. Hooper, W.D. ; Ash, H.B. (1934). Cambridge, MA: Harvard University Press.